Well, the train was interesting. Again, there were no checked bags, so Lauren's "tank" couldn't fit anywhere. Josh and I were rooming together along with four other random and unknown people. Lauren decided that she wanted to room with us instead so Ashlin (not wanting to be alone) came with her. They changed beds with the two guys above us, or that was the plan. Lauren took the bottom bunk across from Josh with her "tank" and I went above her. The night was kinda creepy because the guy above Ashlin kept leaning over the side of his bed to stare at her. I woke up and caught him quite a few time, so I made it clear a few times that was not cool. I slept some, but not all that much. I got up about 7:30 a.m. and they had kim-chi for breakfast. I didn't touch it and then we had to get off the train about 8. Then we met "tiny guide." She is so tiny! Well, she took us to a long set of stairs after we had already climbed one set of stairs. Then she wanted to take my bag up the stairs. I said she had no chance of doing so because she was way too tiny. Anyway, we eventually made up the stairs and onto the bus. Well, after the train, I was not in the greatest of moods when I heard that we were going to be walking all day before finally going to check in at the hotel. I was actually in such as bad mood that I didn't take any pictures at either Tienamen Square or the Forbidden City. I did get a couple from Jessica so you can see where we were. I think my mood was a combination of the train, my lack of breakfast, and dehydration. It was not a good morning. Then we went to lunch and I was able to get some food and water and sit to chill out after the train and I was better for the afternoon. Lunch was amazing. It was a lot like shabu shabu. I really liked it. It was Ivy's birthday today and Crystal, Dr. Vartanian and Grace bought her a chocolate cake. It was an awesome end to an awesome meal. When we sung her happy birthday, the two guys at the table behind us started singing with us (yes, they were a bit drunk, but that was cool). Finally, we headed off on the bus to head to rickshaws. It was interesting. We rode through an area of town where local Beijing people live. I definitely didn't expect half of what I saw. Then we found out that we had to tip our drivers. I had thought that our guide was taking care of that because she hadn't said anything before hand, but she explained it to us while they were looking at us like we were crazy, rude Americans. Then, we headed to the hotel and I was SO happy about that. "Tiny Guide" gave us 40 yuan for dinner and then we checked in. 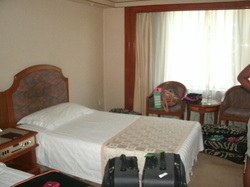 When we got there we discovered that there was wireless internet throughout the hotel and it was free. We were ecstatic about that! Eventually get to the room, we found them to be very nice. We went to bed on a comfortable mattress. So much walking - Yep, that means THE Wall. Today started out with Jessica and Paizley waking me up at 7:30. They went down for breakfast and then came back five minutes later saying that the hotel didn't have them on the list for breakfast. Five minutes after that, Boyoung knocks on the door to tell us that if we want breakfast to follow her now. I had just gotten up and decided that was too much work, so had planned to skip breakfast. Ten minutes after that Crystal knocked on the door to tell me to follow her down to breakfast. It was really good. They had some sweet buns that I couldn't get enough of. 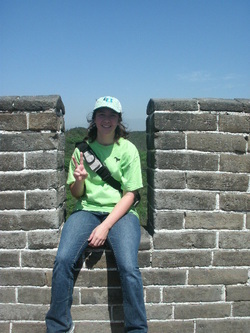 Then we headed off to the Great Wall. It was a long bus drive, but we finally got there. Then we had to hike up to the gate. Then hike to the entrance and finally hike up the wall. Not quite all of us went to the top. Ashlin (who had a cold) and Crystal (who stayed with Ashlin) didn't go up as high as the rest of us did. I really enjoyed being up there and surrounded by blue skies again! I really just enjoyed not being in the city. We saw them constructing a road and it was cool that they were using ponies over here to help them build it. Of course, I like this even more because they share a common ancestor with the Bedouin Ponies which were an ancestor to the Spanish Jennet -- which is an ancestor to the American Mustang (my horse). That made it awesome. While admiring the ponies, some random Asian guy wanted to take a picture with me, which I had no objections to and found to be a fun experience. He was middle aged and didn't speak that much English. After our group picture we headed down the wall. Then it was time for lunch. For lunch we headed to a restaurant that was attached to a shopping area. We were offered a table where we would be served, but we voted for the buffet. It was awesome because not only did they have dumplings, but we could get whatever we wanted to drink without them constantly trying to give us Heineken beer. It's extremely popular over here. So, after finishing out meal, Ashlin decides to go get a shot of this 56% Chinese alcohol and immediately Ivy wants to join her, then Lauren. Paizley hears about it and wants to join in as well. So Ashlin goes to get these shots and brings me one. I stared at it just hoping death would come quickly. Jessica smelled it and swore off it then (she never tried it). Then Paizley came to join our table and we all took that shot. It burned, but I will say that it's better than some other stuff people keep trying to give me. Surprisingly, it doesn't taste like Nyquil, it's just super strong. So I had to buy a small bottle of it. Yes, I am making my parents try it when I get back. Next, we went to the underground tomb. This was quite interesting because it was the emperor's tomb and people had been giving money, but it was all just laying out where people could pick it up, but no one did. It was a fascinating cultural difference. I had to ask Crystal about it and she said it was because people held too much respect for the dead and/or were superstitious that the dead would haunt them for stealing from them. Anyway, originally the emperor and his wife were buried there. But when one of the concubine's grandson's became the emperor, he gave his grandmother the title of empress. When she died, he had her buried next to the emperor and had all of the same honors bestowed upon her as the emperor's wife had. That was really cool. Grace gave some of us a couple of coins to throw onto the tomb. Well, Ashlin and Paizley threw theirs on top of the emperor's box, I chose to throw mine into the concubine turned empress's box because the side was open. After failing a few times with some light coinage, Grace handed me a heavier coin and it went right it, we could hear it sink. I was quite happy about that. When we got out of the tomb, we headed up to a very pretty area that overlooked the surrounds. This was the Soul Tower. I took a couple of panoramic shots and then we headed down to the museum. It was pretty cool looking at some of the stuff they had pulled out of the tomb and even more shockingly, people had buried these nice things with them. It does make sense when you look at it from the perspective of the dead needed things in the afterlife. Then we headed to dinner. As always, I was excited. We had fish, soup, rice, corn, duck, etc. It was all really good and that last fish dish, that doesn't look that appetizing, was amazing. I don't know what kind of fish it was, but it was so soft and the bones were large enough to reach. I was quite happy about it. Temple, palace and the last guided day. Longevity, I think this sums up everything. It was today that I realized exactly how much impact this trip has had on me. I had always acknowledged China was old and had a lot of history, but we actually experienced it. We started out by visiting the Temple of Heaven. Yes, that is the temple everyone knows about. It was quite impressive. While we were there, there was a festival going on. There were people dancing, playing games, doing martial arts, etc. It was a cultural experience just to watch. The longevity of China is astounding and even more so when you see how well they keep up these buildings that are thousands of years old and made of wood. Then we headed over the top University in China. It was Monday and visitors were not allowed in during school days, so our student guide had to sneak us through the gate. It was interesting, but cool. I was mostly hoping our student wouldn't get caught and get in trouble for showing us around. Next we headed to the Summer Palace. This had to be my favorite palace. It was placed on a lake and was the residence of the Dragon Lady. She was China's only female emperor. She ruled quite a while and did not let anything endanger her throne. 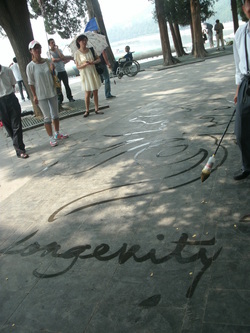 While we were there, I saw this guy painting on the sidewalk and he had written longevity. This was where I realized that this trip was almost over, but what I take away from this trip will stay with me forever. I have come to appreciate my home significantly more than I did before. Even the seemingly simple things like being able drink tap water is a great privilege. I had always know these things were true, but the reality never truly sets in until you are taken to a place where normal isn't normal for you. We were all tired, so Crystal treated us to the Dragon Boat trip across the lake at the Summer Palace. It was awesome sitting on the water and being able to look at everything from a little farther out. I quite liked that boat. Finally, we headed to lunch. We had a variety of seafood and most of them were lacking bones. I was quite excited about that. It was funny when Josh and Lauren had Ashlin convinced that sea snail was a salt water rainbow fish. Regardless, I thought it was good and so did she until she learned the truth. "Tiny Guide" had to leave us right after she dropped us off at the hotel as she had another tour that night. So we bid her our good byes and headed up to our rooms. It was an early end to our last guided day in China, but hat was fine with us. We were still really tired and this gave us a chance to rest and for me to catch up on my blogs. After this trip, I think all Americans should visit China. There are so many things that can't be fully grasped without visiting. The long term effects this trip will have on my thinking will only be seen with time, but I can already tell that I feel differently than I did before this trip. The painter had it right, longevity is the word of the day. The Beijing Zoo - the last day of the trip. Today was the free day. Whatever we wanted to do, we could do. So Ashlin, Grace and I decided to go to the zoo instead of going to the silk market to go shopping. I was a bit shopped out, Ashlin had been dying to see her panda and Grace wanted to take pictures of the animals. So after we checked out of the hotel and dropped our bags off behind the front desk, we caught a taxi and headed off to the zoo. As soon as we got there, Grace split up from us. Probably because we were going to be going a different speed through the zoo than her and there were only certain things we wanted to see. So we started out with that one thing Ashlin has been wanting to see this entire trip. Yes, that would the Panda. And we saw pandas. They had adults and babies. It was awesome. Then we checked out the rest of the zoo, starting with birds. I tell you that zoo had some of the coolest and strangest birds I have ever seen. They came in all shapes and sizes. They even had one that was about the size of a small Australian Shepherd and had this huge mohawk thing around it's head. Turns out it's a type of pigeon. They also had some varieties of pheasants. Next, we headed off to the big cats, but got side tracked by the foxes. Or at least I did. They had red foxes, arctic foxes and fenec foxes. They were so cute! Then we got back on track and headed to the big cats. They were all asleep, but we got to see lions and tigers. They had a white tiger which was quite cool. Continuing on we found that the Beijing aquarium was attached to the zoo, but you had to pay 120 yuan to get into it. I didn't have that much on me and Ashlin didn't want to spend it. So it worked out that decided not to go. Probably a good thing, because I was was blown away by the Shangahi aquarium and I don't think the Beijing aquarium would have stood a chance. Besides the Beijing aquarium is more about shows and salt water. I like freshwater. 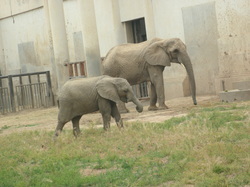 Anyway, next we headed to the elephants again there was a baby and there was at least one pregnant. That's the only logical reason she was so fat. Finally we headed off to find food. I got ice cream and Ashlin got a popsicle. We had decided to get McD when we got back to the hotel. Finally, we headed over to see the reptile house and we planning to see the penguins but that would have cost another 10 yuan which none of us really wanted to pay. That was how we ended out last day in Beijing. We met up with Grace, stopped by the hotel, found out Jessica was awesome and had gotten me some calligraphy brushed for 50 yuan (I had given her some money and asked if she could try to find them) and then Grace, Ashlin and I headed to McD for our last meal in Beijing.